President Goodluck Jonathan on Sunday in Abuja described the bombings in the county as a burden Nigerians must live with until it fizzles out. Jonathan made the remark when he received in audience a delegation of the Christian Community in FCT led by FCT Minister Bala Mohammed. Jonathan said there was no justification for the crime and called on Nigerians to continue to pray for peace in the country. The president was reacting to the bomb blast that occurred in the early hours of Sunday in Madalla, in Niger, shortly after the end of a church service. “We have challenges as a nation; even this morning, a very ugly incident happened in a Catholic Church. We are yet to get the number of deaths in the incident. The issue of bombing is one of the burdens we must live with. It will not last forever; I believe that it will surely be over,’’ he said. 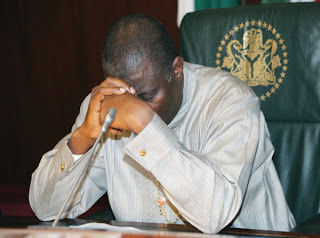 Condoling with the families of those who lost their lives in the incident, Jonathan said that there was no reason for such an act to be carried out on a Christmas day. We should say Merry Christmas but we are not your goverment, we are not in the business of deception. After almost ten hours of gathering your thoughts to speak on the bomb blasts that rocked the nation yesterday, you still fell short of your own very low standards. What did you intend to say when you said Bomb Blasts are a burden we must live with? Why do you bother to budget over a trillion for security if we must live the burden of insecurity? How come you are still a president? We do not blame you, we blame our older ones who were stupid enough to think that where you come from and your religion was all you needed to be a competent president. They are crying now. We all cried yesterday on the darkest Christmas day of our short lives. While we cried and left Christmas postponed for another year, we watched as you danced your life away like there was no tomorrow. Is it true that all you care about is the fact that you are the president so whatever can happen should happen. Last night we prayed for you. We prayed that the white men should be able to make common sense so that we can budget for it and then you will have it in abundance. As it is, it is obvious sir that you are grossly lacking in common sense. If you weren’t, you would never come out to tell a mourning nation that it should get ready to live with the burden of destruction and insecurity. That was utterly insensitive and even the dumbest of our mates, fellow Nigerian children would never descend that low to an unprecedented level of cluelessness.